Port Richey, Florida is a suburban city in Pasco County in the Tampa Bay, Area. It was established in 1883 but wasn't incorporated until 1925, a year after neighboring New Port Richey incorporated. Port Richey's most famous resident was Johnny Cash, who along with his wife June owned a home along the Pithlachascotee River from 1978 until 2002 and visited frequently. Today Port Richey remains a small enclave of about 3,000 residents in its 2.7 square miles. If you are searching for a Port Richey pool builder to turn your backyard into the a beautiful Port Richey outdoor living are for your family, Grand Vista Pools is a pool builder to consider. We have been building new swimming pools in Port Richey, Florida for more than 20 years. One unique quality which makes Grand Vista Pools a attractive option is not only are we an experienced swimming pool builder, but we are also a licensed general contractor. For this reason, we can design and build your entire outdoor living space including any renovations to your home which would help connect your indoor living space with your outdoor living space. Do you have an old swimming pool that needs remodeling? Want to add some life with water, lighting or fire features? How about a spa? We can do everything from basic pool resurfacing to an extreme makeover. 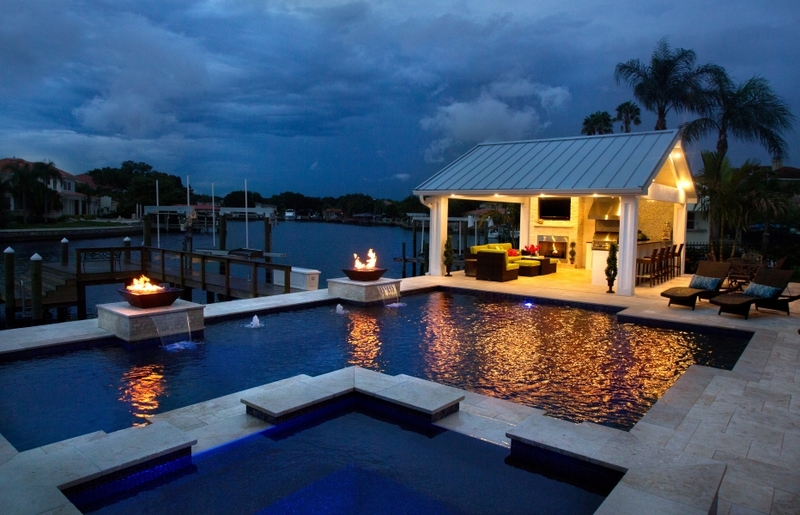 Grand Vista Pools also specializes in designing and building Port Richey outdoor kitchens. If you can dream it, we can design and build it - from a rugged outdoor grill to a full kitchen to a fun outdoor bar.